Each year, eco-friendly or green weddings are always the center of attraction. Eco-conscious individuals planning their weddings sometimes face different dilemmas when it comes to wedding favors, especially if they have no idea what the best eco-friendly favors fit for a wedding are. Sometimes the budget for the wedding is too small to warrant a wedding favor while others have no idea whether they should offer their guests any wedding favor. The reason to go green on a wedding is about conserving, resources or money, and the issues appearing might cloud a wedding that should be wonderful and out of this world. By the same token, a wedding favor is a traditional element of a wedding and crossing it out from is almost out of the question. 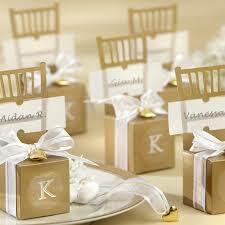 Those unable to cross the wedding favors from their wedding lists should not panic about the choices open to them. Eco-friendly ideas can be incorporated to make them inexpensive and easy to find in a unique way. You might have favors that are not eco-friendly but the packaging can be made in a way that the environmental impact is lowered by ensuring they have been packaged in recyclable or organic containers. Brown paper bags or sacks remind many people of groceries or lunches but they can also be great containers for the wedding favors you intend to give your guests. You can thread a recycled ribbon across the top by punching a number of holes to give the wedding favor a rustic beauty and unique charm. Many people have never seen a flat liquor or wine bottle before and making it a wedding favor for your guests will be something out of the ordinary and one that will be greatly appreciated. These flat bottles do not necessarily have to contain the drink and are cheaply sold. Their flat melted bottle nature also makes them wonderful cheese trays. They are mostly made from reclaimed bottles and help to reduce landfills and damaging the environment. Handing them over as wedding favors ensures that you have protected the environment since they are just not easy to throw away. Through personalized yet reusable canvas bags you have a great way of offering guests in your wedding a wonderful memento while helping the surroundings. This is because reusable canvas bags are reused as beach totes, book bags and even as grocery bags. It is possible to find the most gorgeous and exquisite small boxes, perhaps made of plastic or wood with a personalized touch about them. After the wedding, the guests will use them to store some of their little tokens at home, such as paper and hair clips, keys, jewelry and sometimes coins. You will find so many candle holders made of different materials such as glass. You can use them as wedding favors, considering they are usually made from reusable wine and liquor bottles, kiln fired and beaten into some of the most wonderful shapes and sold at very affordable costs. Marie is a blogger who has been writing on unique craft items like the Flattened Wine bottles made after recycling Wine Bottles. She just loves to recycle and is very particular with what goes out of the house into the waste box.